Limit calculator counts a limit or border of a certain function. One-sided and two-sided being supported. The limit calculator helps to calculate limits at positive, negative and complex infinities. The final answer is simplified. First, write the variable and the point at which taking the limit. In the example below, that’s “x” approaching 3. Then, enter a valid expression, but the important thing is to make sure “Evaluate the Limit” is chosen in the menu, and then click Answer. In order to start, try working from the example problem, which is in the box situated below. It is rather easy in usage and considers being a very useful tool for students. Not a simple answer, you created an overflow in the calculator's data limit, but that is a limitation of the calculator. In reality, those numbers could be endless. I have a question. 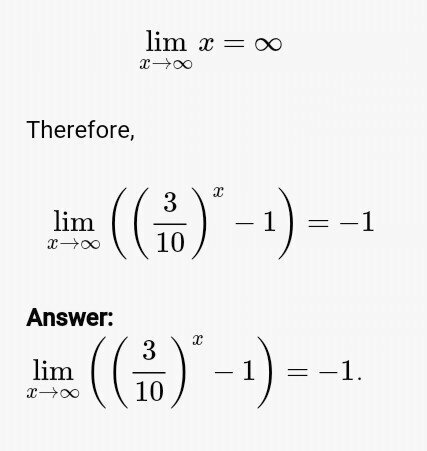 If x increases without bound, then doesn’t it mean that limit of 3/10^x is infinity and doesnt it that infinity minus whatever number is practically infinity? How did it come up to the answer -1? limit (as x approaches infinity) of ((x^2)(1+ sin^2 (x)))/((x+ sin (x))^2). Can someone please help me with this?. If possible, may anyone also put the step by step to the answer? I’m plugging it in but, I’m getting steps are not available. Anyone know why it flags this as an invalid function? Yes, the answer is 0.